Adding up the play-making impact of a defender, in terms of either WPA or EPA, produces +WPA and +EPA. Summing up the impact of an offensive line's opposing front seven defenders can tell us how well that line has performed. 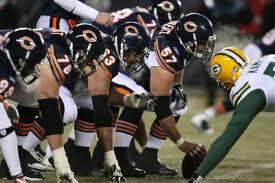 For example, consider the Chicago Bears offensive line. We can add up all the +WPA of their opposing front seven (and exclude pass defense plays for linebackers). All their opponents' sacks, stuffs, tackles for losses or short gains, tipped passes, and quarterback hits that result in incompletions--anything that results in a setback for the offense--comes to a total of +0.57 WPA per game. These are all plays the offensive line failed to prevent, and we can say the Bears offensive line has allowed -0.57 negative WPA (-WPA) per game. That -0.57 is meaningful because it's measured in terms of the impact on winning, but it only measures half of the story. It only captures the half of plays that result in setbacks for the offense, so even the best teams will have a negative sum. Going a step further, however, we can calculate that the NFL average so far in 2010 is -0.38 -WPA for all 32 offensive lines. Chicago's offensive line, therefore, is responsible -0.19 WPA per game more than the average team. After all that theorizing and number crunching, I can still wrap my head around that result: The Bears offensive line has played bad enough to cost their team a 19% chance of winning each game. On the other side of the ledger are the Colts. Their offensive line has a -0.19 -WPA, which is 0.19 better than league-average. We can estimate that the Colts line helps their team win to a tune of +0.19 WPA per game (with more than a little help from their QB). The usual caveats apply. Quarterback and running back performances obviously have much to do with the impact of the defensive front seven. Still, this is large part of the picture, and further, it does more than any other stat to isolate and highlight the contribution of the offensive line, the part of a football team least recognized by statistics. And of course, stats don't tell the whole story, especially when it comes to individual performance. Below are two tables, the first in terms of -WPA and the second in terms of -EPA. These are measures of an offensive line's ability to prevent opposing front-sevens from making plays--sacks, tackles for losses or short gains, forced fumbles, QB hits, and so on. Each column lists results in two columns. The first considers defensive lineman impact only. The second considers defensive lineman impacts and linebacker impacts on run plays and pass rushes. -EPA is less context-sensitive, and likely more predictive, than -WPA.